Where has the time gone ? This post is my 750th . I can hardly believe it ! I LOVE sharing the Shop with you. Here are a few more pictures for you to enjoy. Wishing all of you a WONDERFUL EASTER... We are so excited to be getting a new restaurant here. They are taking the 100 year old building and restoring it back to how it was originally built. Exciting to see the original windows uncovered and the roof line put back . I love it when someone puts so much time and effort into making it right ! Some pictures from open house....What a WONDERFUL time we are having ! So good to see so many old friends and meet some new ones. The weather was cold outside...but it was definitely SPRING inside ! Hope you can make it by tomorrow. " 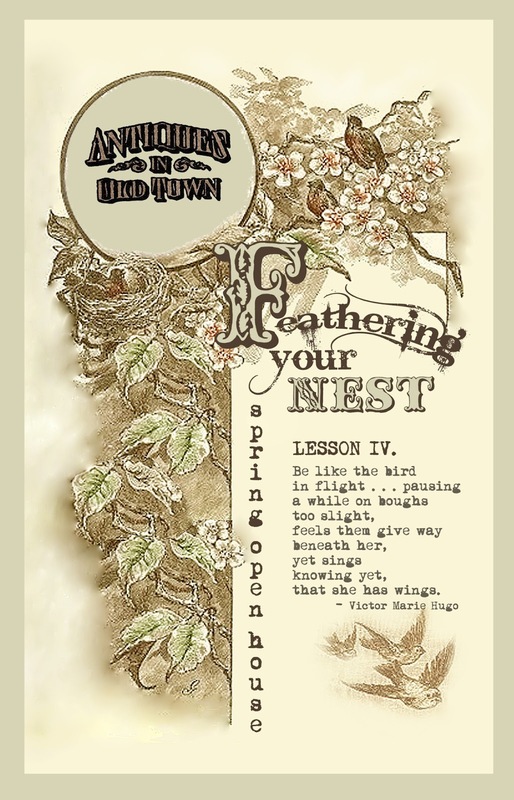 Feathering Your Nest" 10:00 to 5:00. 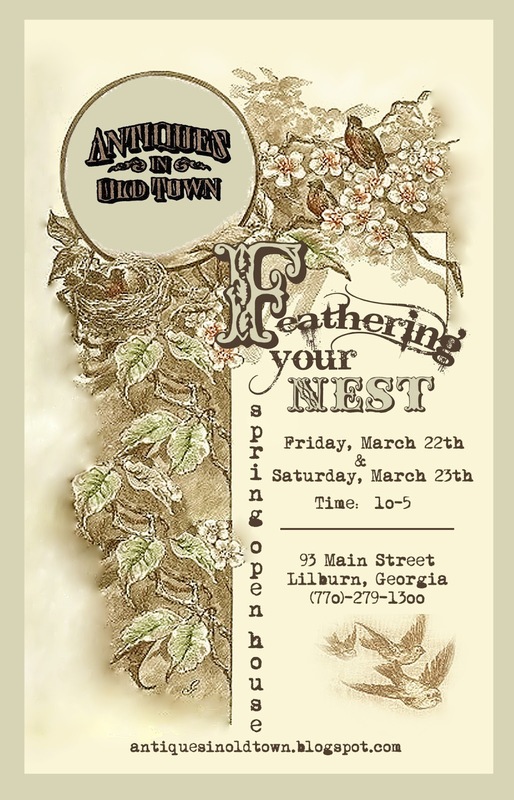 Also from 1:00 pm to 5:00 pm at Lilburn City Hall we are having an Art Show complete with wine and cheese, catered by Sprig (our new restaurant opening in June ) and from 10:00 am to 12:00 there will be an Easter Egg hunt in the City Park . Come on down to Old Town. Join in the FUN ! The Girls have been working SO HARD ! Spring has sprung all over the Shop ! The Bunny even brought in some carrots ! Open House starts tomorrow at 10:00 am. So looking forward to seeing YOU ! Still lots to do....back to work. We worked and worked on Sunday . Swapping booths and CLEANING..... Only 4 days until Spring Open House ! So much to still do for " Feathering Your Nest ". The Shop will be CLOSED on Wednesday and Thursday so Dealers can bring in their Spring Treasures... 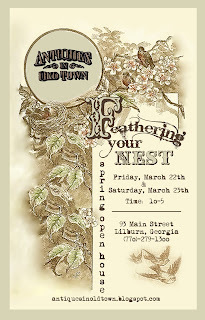 I think this will be the BEST Spring Open House ever.....so many wonderful things are coming in ! Hope to See You on Friday ! We potted up lots of Spring flowers and Herb baskets....praying my Easter grass is sprouted and grown by open house ! Nesting.... YES....but not as in sitting quietly , but in making nests......LOTS of Nests ! A labor of love....while making these I think about how the birds labor to build theirs.